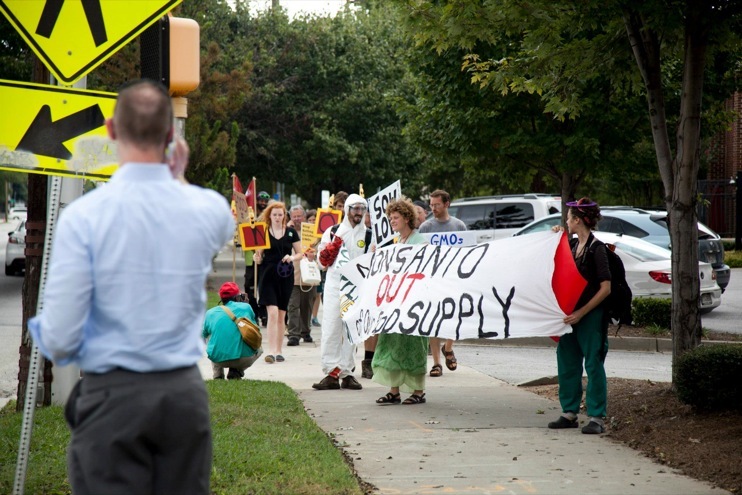 Atlanta’s Food Supply Rescue Coalition Holds March Calling for End to Monsanto’s Genetically Engineered Food System. 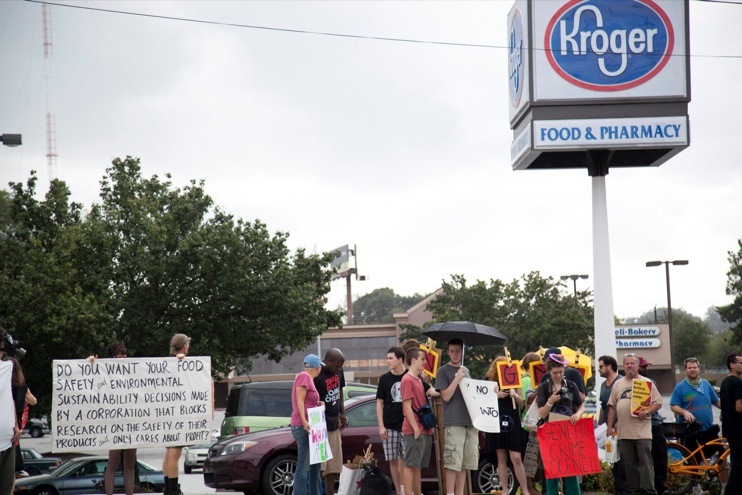 Standing outside an Atlanta Kroger grocery store, food advocate Steven Wing reads lyrics to a crowd of protestors and curious shoppers. “If you’re gonna play God with my food. If you’re gonna play God and leave organic farmer’s screwed. If you’re gonna play God with my decisions…. In a moment that is being referred to as “the food fight of the decade“, the lyrics to “Tell Us What You’re Growing“, written by an Arizona songwriter, Celia, couldn’t be more poignant. 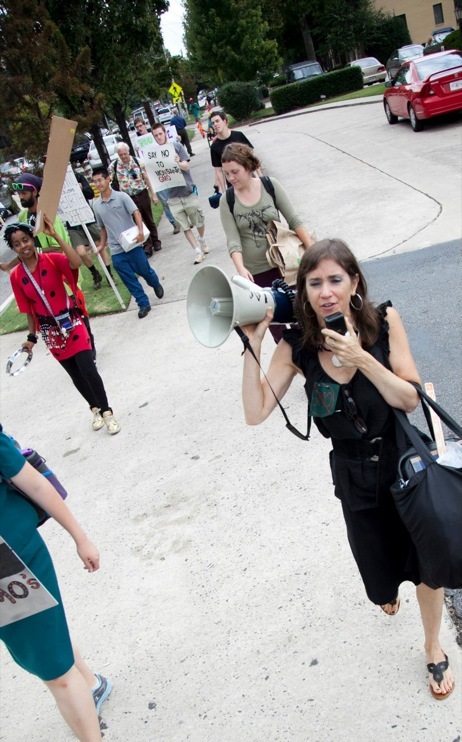 The group of protesters is participating in the “Occupy Monsanto Global Day of Action”. 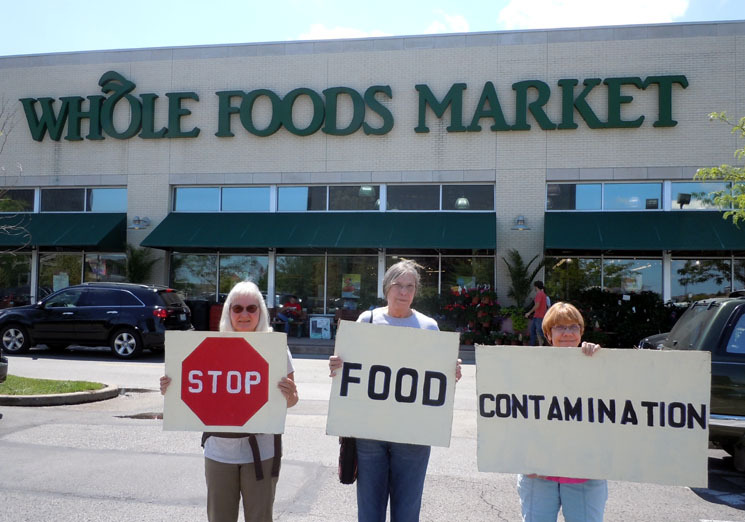 They’re on a mission to raise awareness about lab-created genetically modified organisms (GMOs) within the food supply. 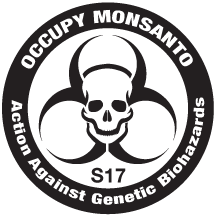 With rally stops at five “Monsanto Points of Distribution” locations – Publix, Kroger, Home Depot, Whole Foods Market, and McDonald’s – the Occupy Monsanto Genetic Crimes Unit (GCU) declares each location a genetic crime scene for their sale of Monsanto’s toxic products. 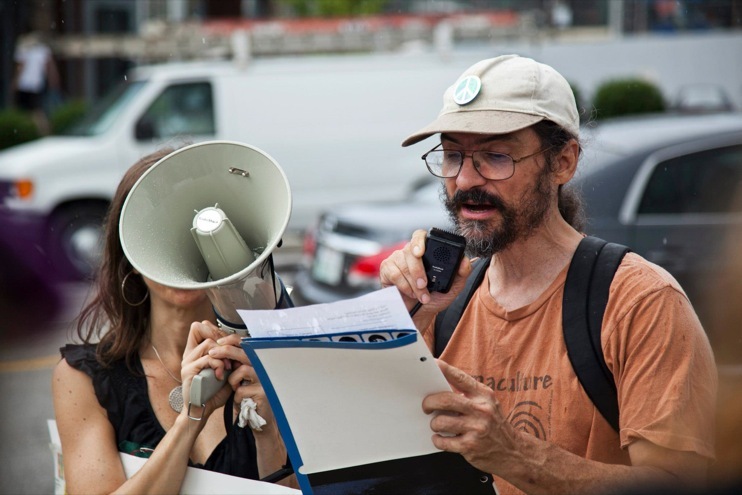 “This is a decontamination zone”, declares Vince C. through a megaphone. 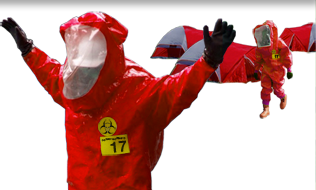 He is dressed in a biohazard suit. “If you’ve been contaminated by Monsanto’s toxins, you’ll need to be tagged.” Shoppers are outfitted with special hospital wristbands to symbolize a health biohazard. 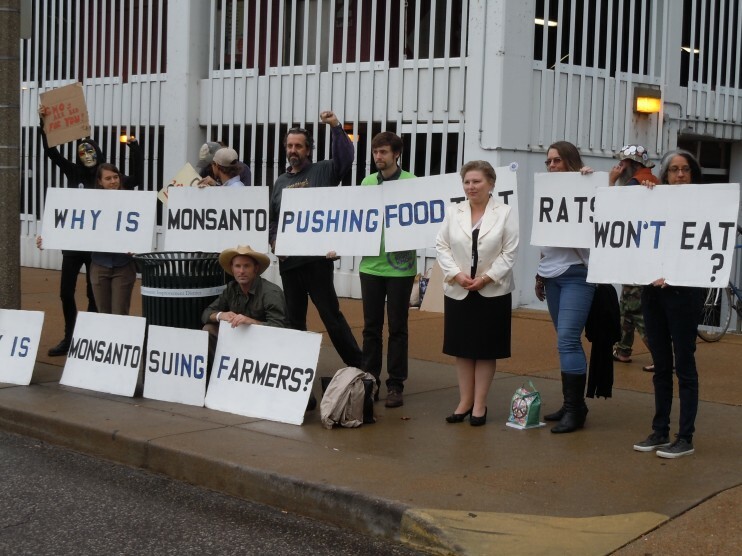 “There’s something wrong when the chemical manufacturer Monsanto, the same company that made Agent Orange, owns our commercial food supply”, says Food Supply Rescue Coalition‘s Jaye Crawford. Ms. Crawford, a fitness professional, mother, and food advocate, formed the FSRC in order to educate the community on the dangers of genetically engineered food. “It’s a shame. 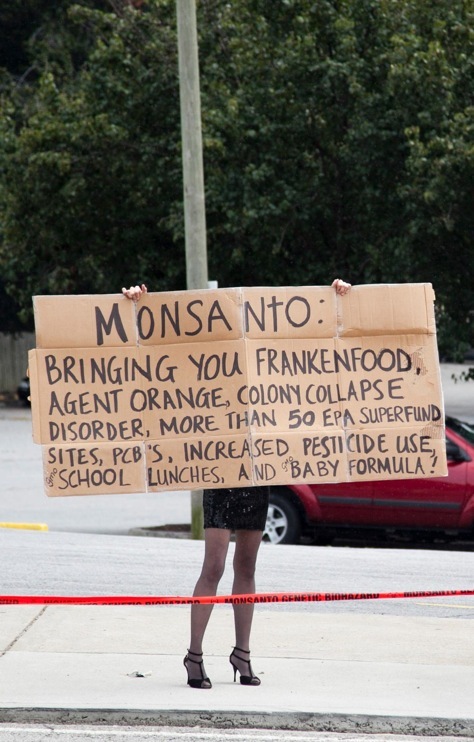 Consumers have no idea they’re eating Frankenfoods contaminated by Monsanto’s GMOs. Consumers don’t know because our government is corrupt. FDA, USDA, Monsanto are one of the same. 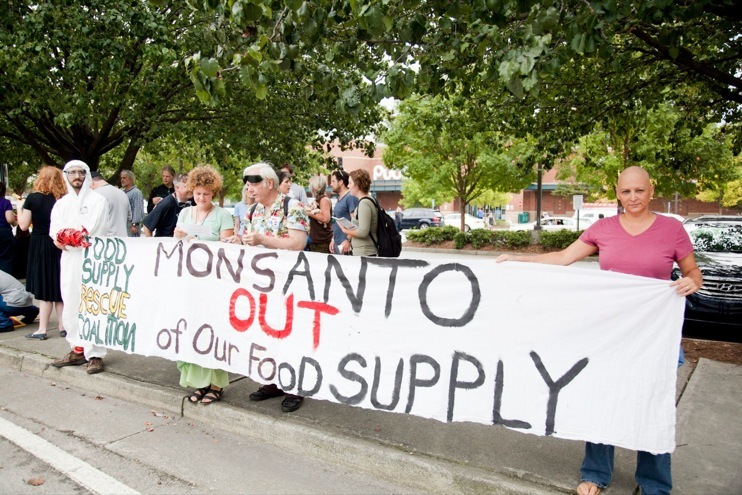 We want a Monsanto-free food supply. We want labels. We want what 50 other countries and 40% of the world‘s population has, which is the right to know, and the right to choose what we eat,” says Crawford. 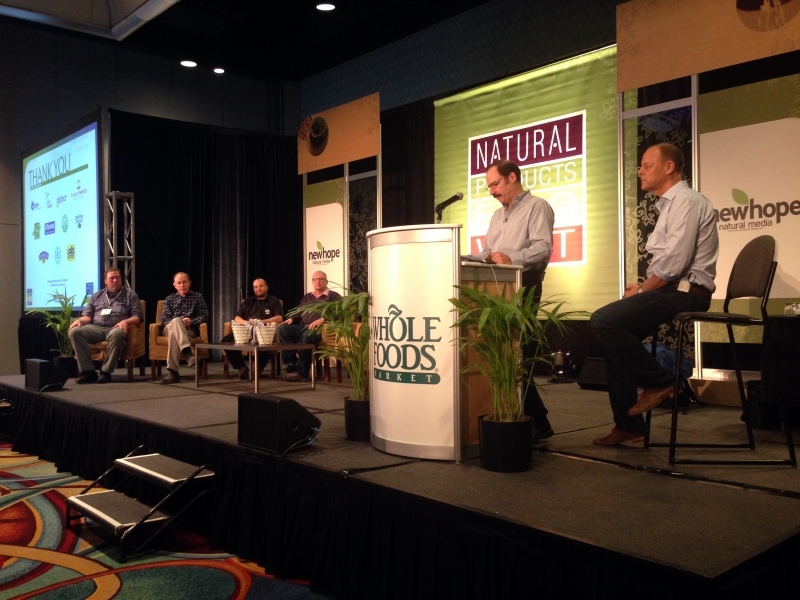 This “food fight” over genetically modified organisms has recently gained attention and the national spotlight. In November, Californians are poised to vote “yes” for the labeling of genetically engineered foods. 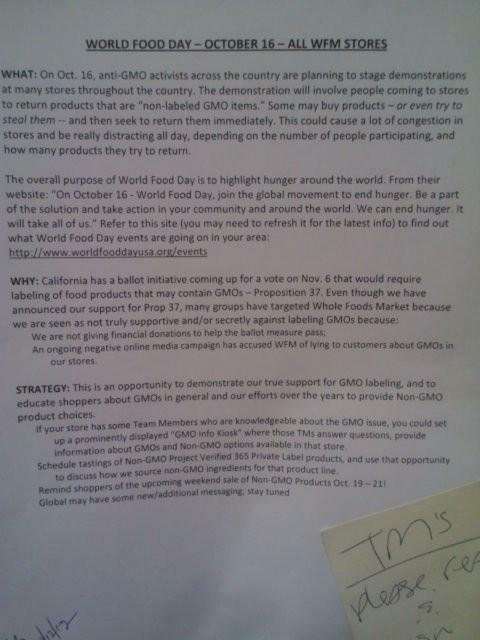 Prop 37, a ballot initiative, would require food manufacturers to label products containing GMOs by 2013. Early voting for Prop 37 begins on October 9. Voting at polling locations takes place on November 6, 2012.